It’s very useful to have easy spread and sauce recipes on hand. You probably won’t make use of them too often, but when your in a pinch, it’s great to have something to whip up quickly. I especially like this following recipe because it contains ingredients that I always have well stocked at home in my Paleo pantry. Oftentimes, it can be difficult to figure out when a spread like this would come in handy. It’s even more difficult for Paleo followers, because it is not like you can easily throw it on top of pasta and call it a meal. But just the other day, I used this spread instead of Hollandaise sauce for my eggs Benedict. It’s also a great spread to use if you want to easily flavor-up some bland meat like chicken or turkey. You can even pour it over some roasted vegetables and you’ve got a delicious, yet simple dish. Whatever it may be, it’s hard to go wrong. It also happens to be very nutritious, thanks to the sardines. Like most fish and seafood options, they are full of selenium and also a good source of vitamin D, calcium, vitamin B12 and omega-3 fat. 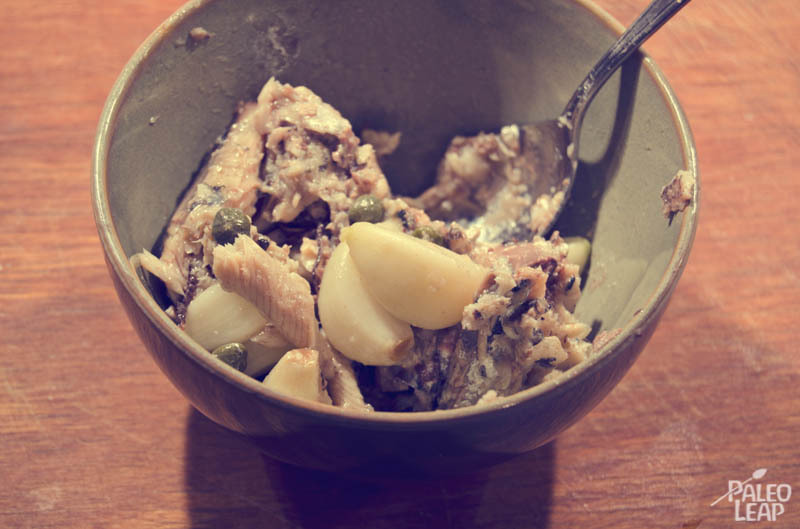 This recipe should satisfy you even if you’re not a fan of fish because, once blended with the roasted garlic, wine vinegar, olive oil and capers, the taste of the sardines become really subtle. Cappers are the flower buds of the capper plant, they are most often used as a garnish and are found pickled or packed in oil. They can taste quite bitter on their own, but when used in recipe like this one they add a great touch and depth to the final preparation. Try to look for sardines and capers packed with only water or extra-virgin olive oil. I don’t think I could ever describe through words how much I love cooking with garlic. I often have to hold myself back from putting it in pretty much everything. It’s what often completes a dish and makes it that much more delicious. As much as plain minced garlic can do the trick, it’s roasted garlic that really gets me. Oftentimes, people don’t take the extra step to roast garlic when a recipe calls for it and assume that raw garlic will work just as well. There is nothing though like the flavor that roasted garlic produces. It’s so amazing that I frequently whip some of for no other reason than to just eat it as is. It’s quite less pungent than raw garlic as well so it suits a wider variety of preparations. Apart from being delicious, garlic also has antibacterial, antiviral and antifungal properties and is used effectively to treat infections and colds. It can be a great natural remedy for IBS. Preparing garlic this way will always make a difference in the final dish that it’s used in. Roasted garlic is most often used in dressings, marinades, soups and sauces. My rule of thumb is that whenever I’m not already roasting other components of a dish, then the garlic should be roasted. It can add quite a bit of preparation time to a recipe and this is why many people avoid doing it. It is also something that you can’t really do too far in advance, as it will not keep very well. So when time is not a factor, definitely go for it. You need to use complete heads of garlic when doing this. Peel away any of the outer layers of skin that are no longer intact. Avoid pulling off too much, as you need the bulb to remain as a whole. Cut off the very top portion of the bulb, about 1/2” so that all of the individual cloves are exposed. Place the bulb on a sheet of aluminum foil, drizzle with olive oil and sprinkle with salt and pepper to your liking. Gather the ends of the foil and close the bulb in completely (I usually bring the ends together and twist them so that a small tee-pee like figure is formed). 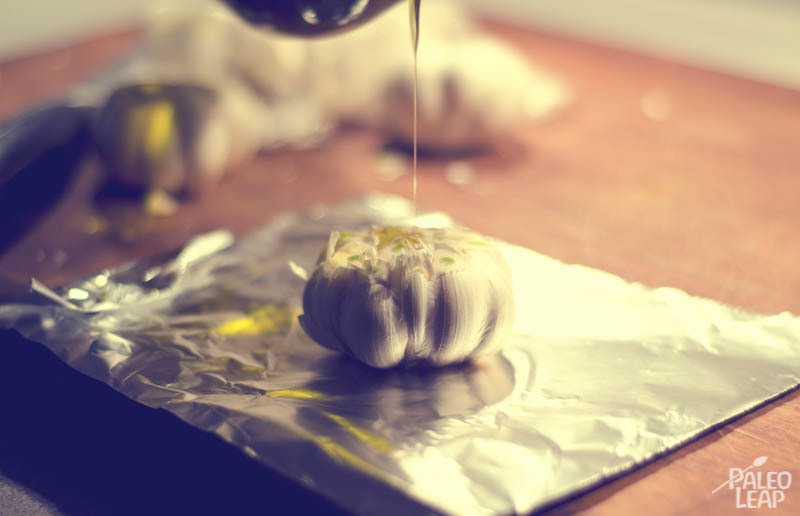 Place your foiled garlic on a baking sheet and bake for 30 to 35 minutes, until the garlic is tender throughout. As soon as you remove them from the oven, open the foil immediately so that heat escapes and they begin to cool. Once they have cooled, you should be able to easily pop each individual clove out. 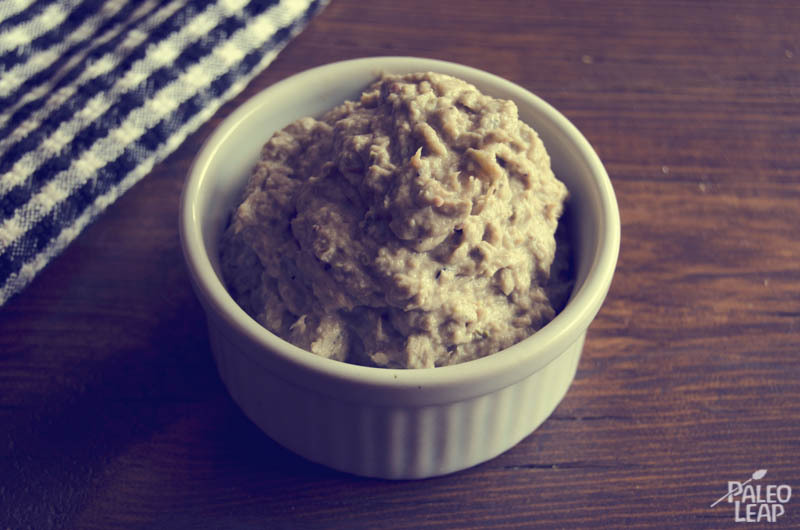 Throw the roasted garlic, sardines, capers and vinegar into a small blender and blend it all until a smooth paste is formed. Taste and add some salt and pepper to taste. Continue blending and slowly pour in the olive oil, this is when a smooth and runny sauce will begin to take shape. Serve immediately and refrigerate any leftover.